Packing for any trip can be frustrating and daunting. But when you’re heading to the fashion capital of the world, the task can seem even more arduous. You know that Parisians are stylish and chic, so you want to do your best to fit in when packing for Paris. But you also want to be comfortable, without toting around unnecessary stuff. Most women I know spend hours mixing and matching outfits, piling every available piece of clothing on the bed until it disappears under a mound of fabric. And though there will always be two types of packers—those who believe in taking only a carry-on, and those who just can’t fathom the thought—there are some essentials any girl headed to Paris should bring along. Black. Lots of black. Black is classic and always in season, and it matches easily with almost every other color, which makes it perfect for layering. Dark clothes are flattering on all figures and hide wear and tear better than their counterparts, so they will be more forgiving if you splash some espresso on yourself. And every girl needs a little black dress for a nice evening out in the City of Light. An umbrella. 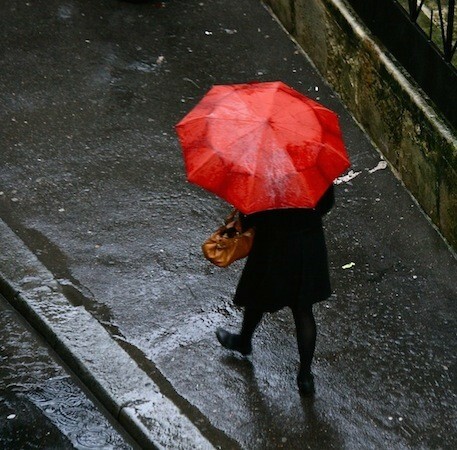 No matter the season, in Paris the threat of rain should not be taken lightly. There are few things more uncomfortable than sloshing around the streets without the proper cover, soaked to the skin and freezing. Don’t let that be you! Pack an umbrella and be prepared to carry it with you. Though you may enjoy the added protection of an oversize golf umbrella, a smaller, more portable option will be easier to pack and to tote around. And when it comes to the design, stick to solid colors or, if you really want to go crazy, perhaps some polka dots. A scarf. It may come as a surprise, but both Parisian women and men wear scarves. Scarves for fashion, scarves for winter, scarves to protect you from catching cold in 50-degree weather, even colorful, gorgeous silk squares that women of a certain age tie in tight little knots around their necks. Pack a few different kinds and wear one daily. And while you’re at it, why not pick up a few as souvenirs to add to your collection? A trench coat. The classic trench is a staple of every Frenchwoman’s wardrobe, and it should be for any visitor to Paris as well. This versatile jacket, which has been around since World War II, is the perfect accessory to complete any stylish outfit and protect you from rain or wind in the warmer months. It also adds another layer of warmth on those chilly, stormy gray days of winter. Knee-length or short, tied or buckled, solid or print, lined or unlined, designer or otherwise, trenches can accommodate every season, style and body type. Something waterproof or water resistant is also a good idea. Try to wear yours on the airplane; this will save space in your luggage and keep you from looking like a wrinkled mess. Comfortable shoes. I know that you have seen photos of chic Parisiennes tooling around the city in stilettos. But I implore you to be practical and not make them your everyday shoe of choice. I’m not suggesting that you leave the Manolos at home, but please understand that you will be walking long and far on uneven cobblestones, which are murder on your feet. For that reason I suggest you pack comfortable, fashionable shoes. Manufacturers like Dansko, Camper, Arché and Ecco offer some great options with arch support. And unless you want to scream American tourist, please leave the clunky exercise sneakers at home! A digital camera. Pocket-size digital cameras have come a long way over the years. You can score an affordable camera that produces high-quality images and shoots video for less than $150. Look for one that has the most megapixels you can afford (in case you want to make a large, framable print later), and that’s thin and compact so you can stow it away in your purse or pocket. The minute you set foot in Paris and see the Seine, the grand French architecture, the cobblestone-lined alleys and the stunning displays in the department-store windows, you’ll be happy you brought it. And make sure you practice for those night shots—you don’t want to miss the Eiffel Tower as it sparkles after dark. Alternately pack very lot and simply use your smart phone. A journal. Taking photographs isn’t the only way to capture your adventures in Paris. Writing is a perfect way to create memories of your travels, and where better to write than in a city where so many literary greats have done it before you? You’ll want to document all of your Paris activities—where you walked, how your first croissant tasted, how your French conversation skills are improving. With your journal in hand, grab a table on the terrace of your favorite historic café, sip a café crème and write to your heart’s content and be sure to write down those places you’d like to go back to on your next trip. Or choose a bench at one of the city’s many beautiful parks and put your literary skills to the task. A positive outlook. You spend months saving and planning for your trip of a lifetime. You check the weather forecast once a day for two weeks before your departure and hope for the best. You cross your fingers that there won’t be any transportation strikes during your visit. But I have news for you: anything can, and most likely will, happen. It may rain every day, the train operators may strike and the hotel staff may lose your reservation. Don’t let these little things ruin your vacation. What will help is a positive attitude. If it rains, go to a museum or spend more time lingering in your favorite café. Trains not running? Walk, and you’ll likely discover a new hidden gem. 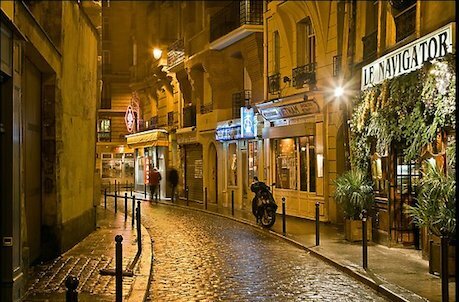 Take a deep breath, don a smile and don’t forget that you are in Paris, one of the most beautiful cities in the world!